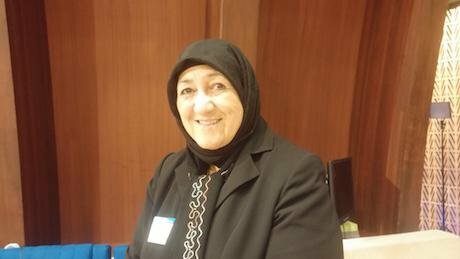 Dr. Sakena Yacoobi just before her speech at the World Forum for Democracy. Photo: Fernando RamirezOne of the most well-received speeches at this year’s World Forum for Democracy was made by Dr Sakena Yacoobi, Executive Director of the Afghan Institute of Learning. Dr Yacoobi’s grassroots organization provides education, training and legal assistance to more than 13 million people in Afghanistan, empowers communities, including women and children, promotes intercultural tolerance and raises awareness about human rights and women's rights. Fernando Ramirez caught a few words with Dr Yacoobi for the openDemocracy Youth Newsroom shortly before her intervention at this year’s plenary session. She was more than pleased to share what democracy means to her and send a message to the youth. Fernando: What does democracy mean to you? Dr Yacoobi: The Afghan Institute of Learning works with thousands of women and men in conflict areas. We need to practice democracy. Democracy to me is not something you take from one country and put it in another country. Democracy is a process and this process needs to be learnt. Fernando: What would be your message to this year’s participants at the World Forum for Democracy? Dr Yacoobi: Participating in this forum, I would like to raise my voice and also say that besides the great benefits technology and internet may bring, we still need to rely on our teachers. So we have to work with them and train them in critical thinking, so that through our teaching and educational systems, we can reach out to the entire society and at the same time provide civic education. We need to provide everyone knowledge about their rights, how they go about with their rights, how to ask questions, and how to practice equality. These issues will not work only through the internet, we will need to create an environment and allow our students to practice democracy in those environments. Fernando: What do you think about the youth and their potential as agents of change? Dr Yacoobi: I work with the youth and I strongly believe in the youth because they have the potential and energy, and they can accomplish everything they go after. So they just need to believe in themselves, and practice, and go after what you believe from their inside and from their heart. Do not let anybody to tell you that you are not capable or do not have the capacity. The potential is there. We just need to promote it because the youth can change the world. I am optimistic that there is a better tomorrow than today. So I look toward to the future and I believe it will be much brighter than what it is today.